Sometimes I wonder if I’ve reviewed a restaurant too many times. I’m sure legitimate food critics would never, unless invited back to right a wrong, actually haunt the same place twice and dare to write about it. 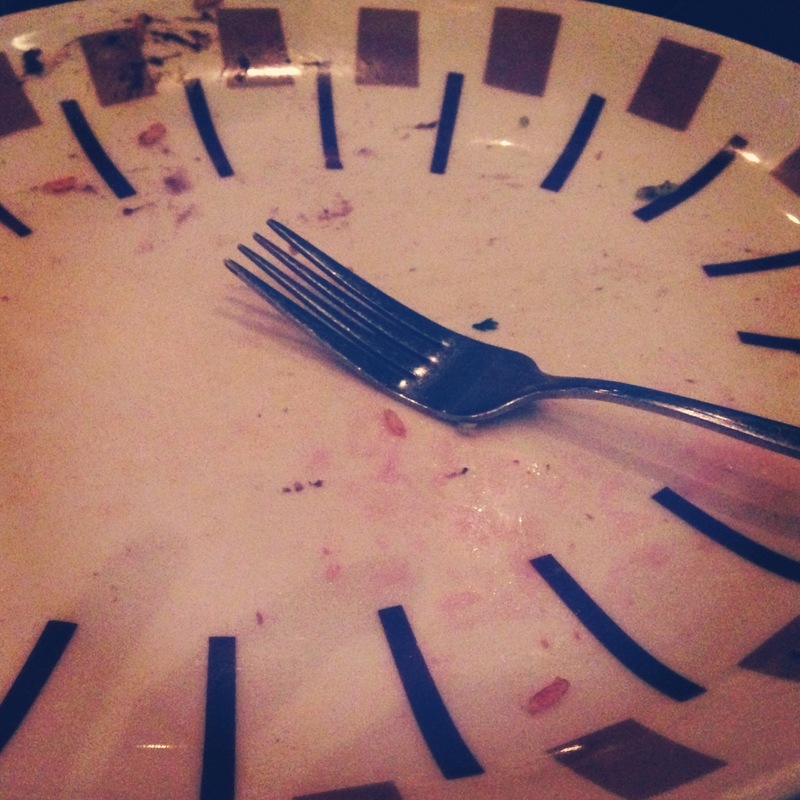 At this point, we’ve eaten at Border Grille in Las Vegas three times and once in Santa Monica. It’s important to note that Chefs Mary Sue Milliken and Susan Feniger celebrate Meatless Mondays at their three Border Grille locations in Santa Monica, Las Vegas and Los Angeles. They actually offer a 2-course meat free lunch and a 3-course meat free dinner at a special price! Now who wouldn’t want to support that kind of business. By far, this latest meal was the best for both of us. And the most pleasurable! Our server was not only knowledgeable about the menu, but made a point of reminding me, the vegan, that not all servers are interested in listening to your needs. Manuel was personable and fun, clearly delighting in his job which obviously brings him in contact with a wide variety of people. I thought it was great that he was telling me that some servers don’t know the menu, they don’t bring the proper attention to your order, etc. etc., so it’s up to me to be on my toes. Well, he certainly wasn’t telling me anything I don’t know by now, but in the beginning of my vegan journey, I sure could have used him! I hope that he continues to tell vegans who enter Border Grille in Mandalay Bay these important tips. And remember: the green sauce in the entrees is NOT vegan. Your server may not know or remember this, so order carefully. We entered Border Grille actually excited for the meal. Many times, when we’re on the Strip, we feel a little apprehensive. Will we get our money’s worth? Will we be sick? Will we even like the food? We’ve been dissatisfied enough times with our dining experiences on the Strip that I seldom write about our meals anymore. But not this time! I know that there’s always something vegan for me, and even though Friand wasn’t enthusiastic about his meal the last time, overall he loves Border Grille. 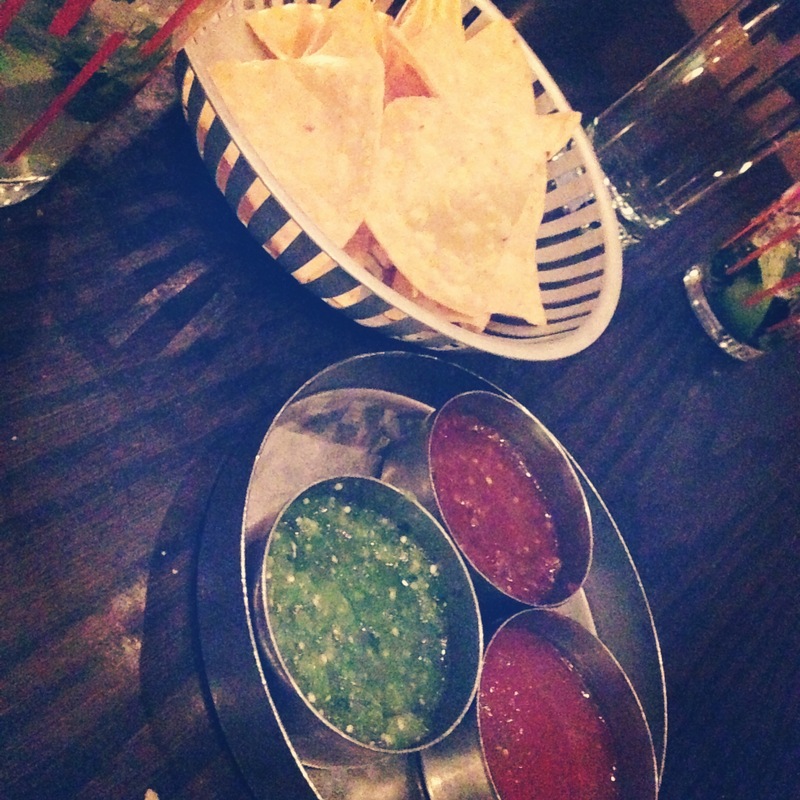 We dove into our chips and salsa trio, ordered our mojitos, which are sweet and weak and go down like candy!, and turned our attention to the menu. 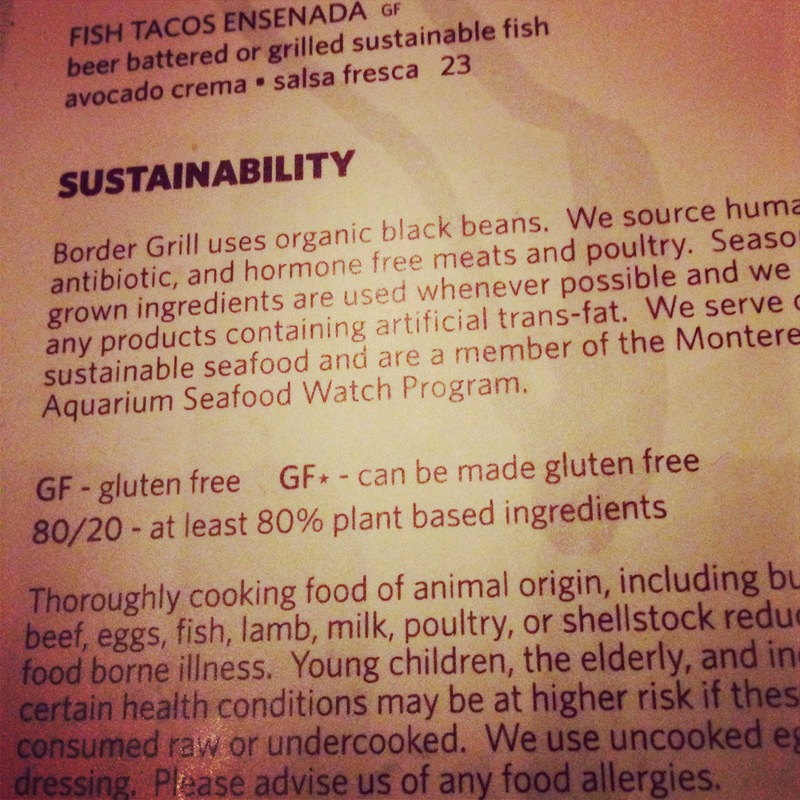 The first exciting addition to the menu is the 80/20 designation and the many gluten free (GF+) options. The sheer volume of GF options is overwhelming! As for the vegetarian (80/20) there are quite a few, but Manuel explained that not all of them can be made vegan. The empanadas, for example, have cheese inside of them. But the Mushroom Mulitas are easily vegan by removing the cheese. But Manuel was not going to let me eat any common vegetarian-made-vegan item from the menu. Oh no! 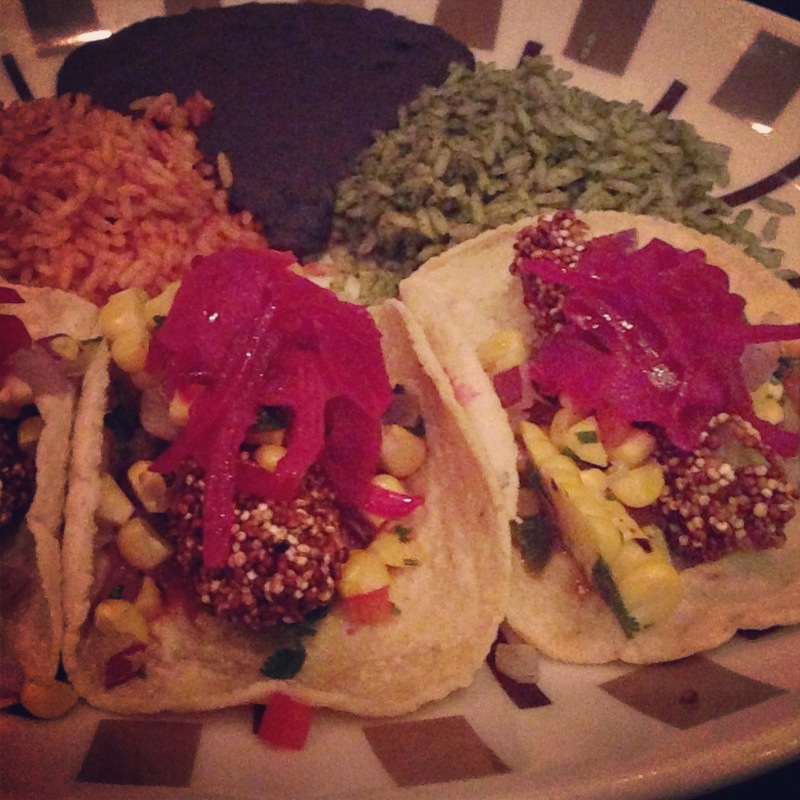 He could not say enough about the off menu “Quinoa Tacos”. It seems vegans die for these things, and even non-vegans love them. 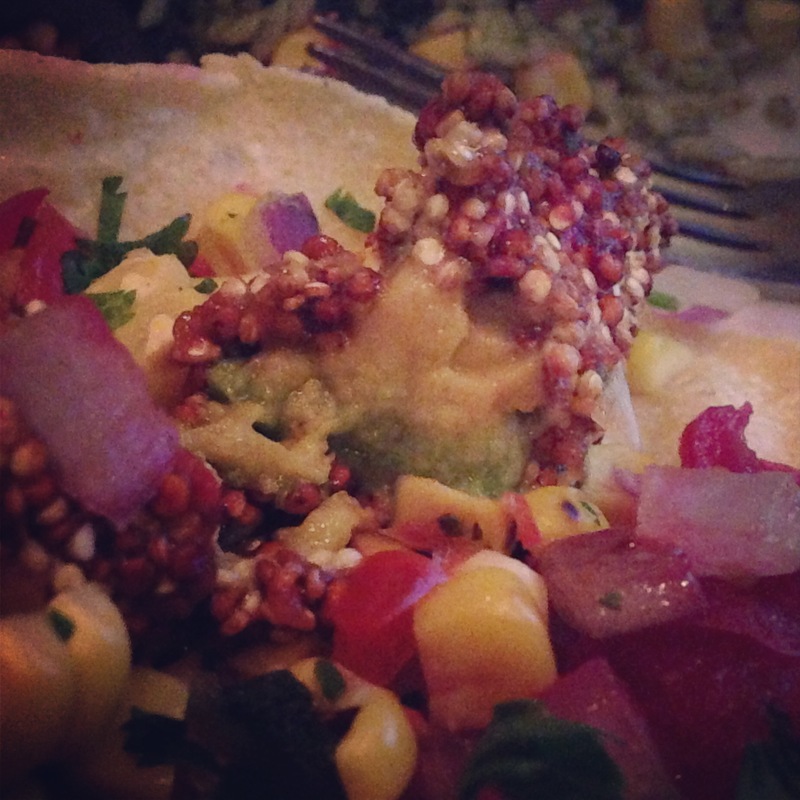 His description of the tacos was a little difficult for me to grasp at first: quinoa coated avocados? What in the world is this guy talking about! But bring it on. I will never ever snub my nose at a personal suggestion from someone so enthusiastic about a dish. I have to stop here and tell you that at no time during this meal was Manuel aware that I am a vegan blogger. If this is how he treats all the clientele, then Border Grille has themselves a gem. I wish the lighting were better so that you could get the true beauty of these little tacos. Charred corn relish, pickled onions, and … yes! Those are quinoa encrusted avocados. I’m not sure how they make it, how they cook it, but it was a stroke of genius. Hands down, the most creative vegan Mexican food I’ve had. Maybe ever. To my delight, the tacos were treated as an entree which means black beans and rice! If you haven’t had the green rice at Border Grille, I suggest you go get yourself some right away. Both rices are actually fantastic, not over cooked and starchy, they’re perfectly al dente and mixed with the black beans feel like a sort of savory dessert after you’ve finished your meal. Again, Border Grille earns herself 5 sprouts and all the free advertising I can give them! Don’t write off Border Grille as just another gimmicky celebrity restaurant at a casino; it’s more than that. It’s a real diamond in the rough over there at Mandalay Bay. It’s a bit of a walk, on the way to the convention center and the aquarium, but totally worth it. I’m happy you found my blog! Going vegan isn’t really all that scary. The “hardest part”, for me at least, is knowing that I’m lactose intolerant now, so any cross contamination is a painful experience that I want to avoid! If you have any questions or need any support, please don’t hesitate to contact me! My blog actually started in 2007 while I was living in Vegas http://thevegasvegan.blogspot.com so there are more reviews at that link. Since moving to LA in 2010, I’ve been back to Vegas a few times to visit my parents and try my best to eat & review every time. Hope you find enough to help you on any future travels! And yes, I am totally into sci-fi and about to check out your blog.